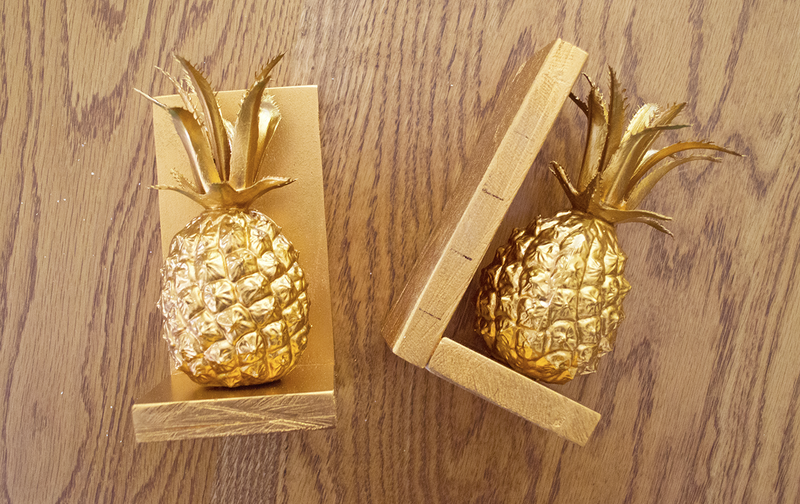 Old Hollywood style brass/faux brass pineapples have been popping up all over the place recently, and as most tend to come with a hefty price tag, I decided it was time to take matters into my own hands. A particularly lovely set of brass-coloured pineapple bookends in an independent interiors shop inspired me to make my own, more affordable version. 1. 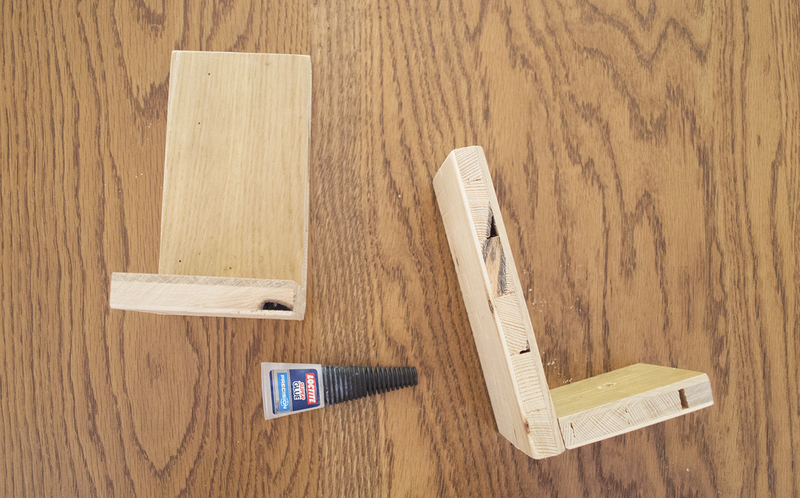 (Optional) Sand off any rough edges on your pieces of wood. 2. Super glue along one edge of one of the bookend bases and press at a right angle onto a side piece. You might need to hold it in place for a few seconds until the glue starts to harden. 3. Repeat step 2 with the other two pieces of wood, then leave your bookends to set. 4. 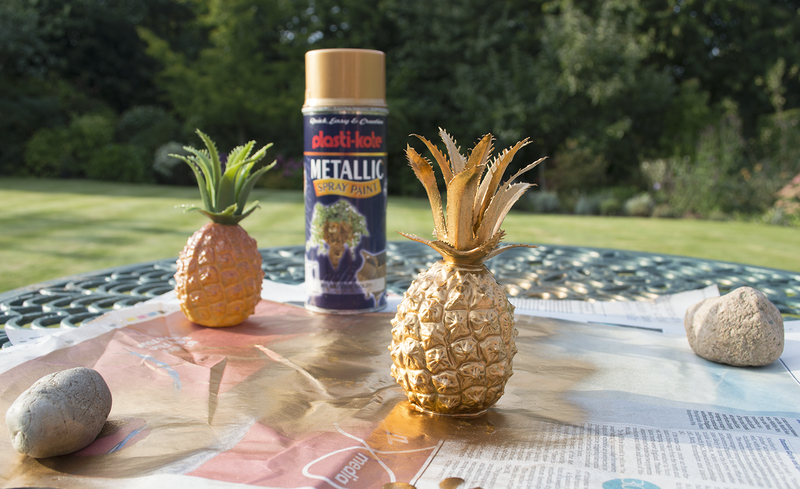 Time to spray paint your pineapples! This step can get messy. I chose to do this outside and on a few sheets of newspaper, to avoid fumes in the house and any collateral spray paint damage (as you can see, I did stain this table a bit, but it needs re-painting anyway). You might also want to wear gloves. 5. Once your pieces of wood are completely set, spray paint them too. Make sure you cover every visible edge, but don't worry too much about the underside of the bases. 6. 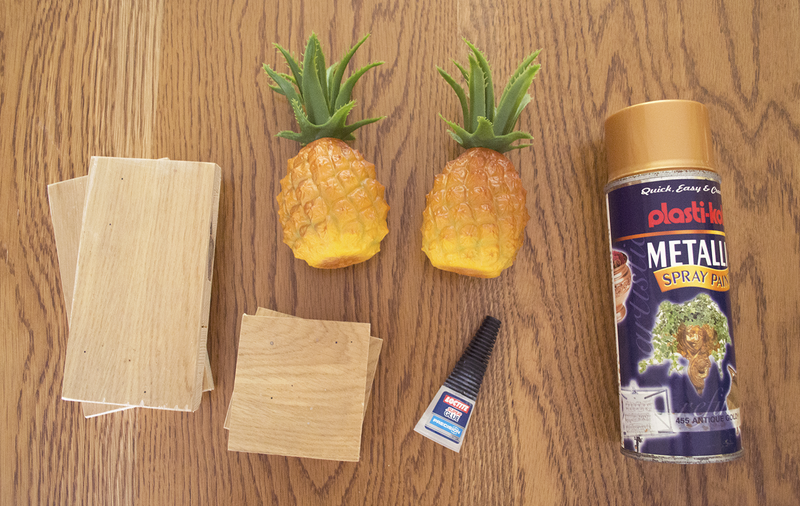 If any of your pineapples or bases need a bit more coverage, give them a second coat, then leave all pieces to dry thoroughly. This shouldn't take too long, but you might want to give them an hour or so to be sure. 7. 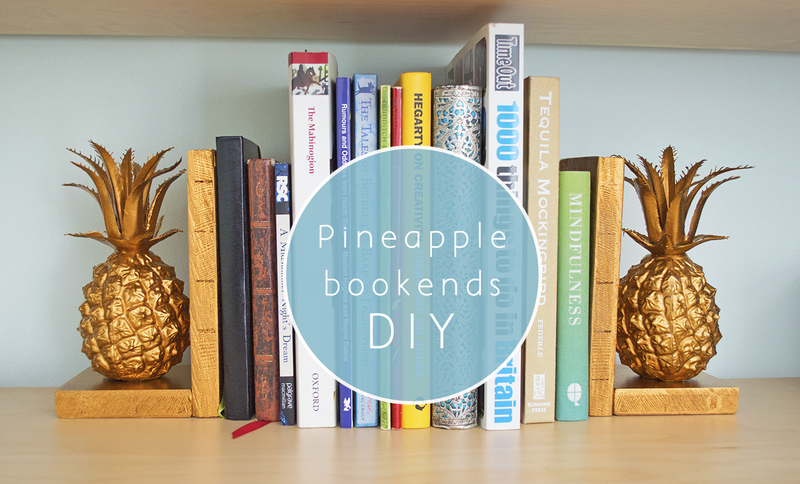 Once all the pieces are completely dry, apply a generous amount of super glue to the undersides of the pineapples and position them on your bookend bases. Again, you'll probably need to hold them steady for a little while until the glue starts to set. 8. Leave to dry, and you're done! Be sure to give them a nice home. Have you tried this DIY or something similar? I'd love to see the results! ?!?!?! This is too adorable! 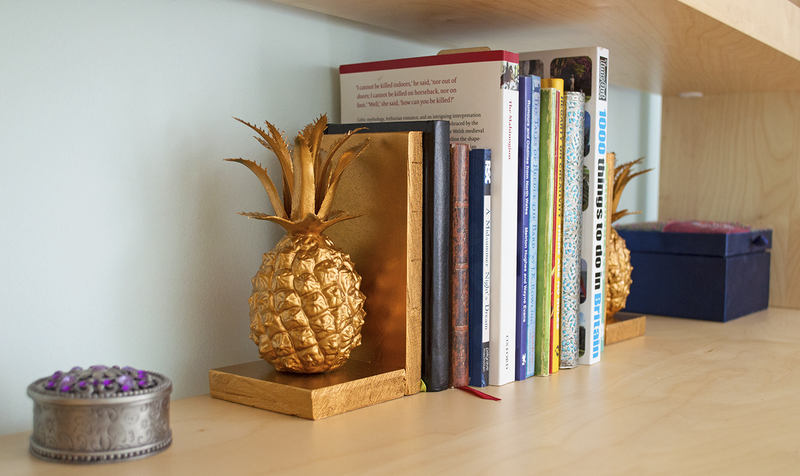 Pineapple as bookends! I'll definitely try this out; it looks so whimsical yet glamorous! How very creative, they look professionally made. Whhhhat? Genius! They belong in Urban Outfitters. i LOVE this !! looks amazing hun !! Omg I absolutely LOVE these! This is such a beautiful idea...I love it!